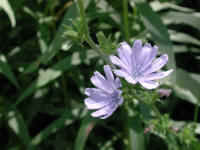 (Chicory (Cichorium intybus) - 01) Chicory are members of the Composite family, and can grow up to five feet tall. Only a few flowers are open on a plant at one time, which gives a somewhat sparse appearance, as depicted in this photo. The flowers last only one day, and are replaced by new flowers the next day. 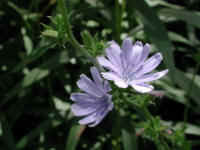 The root of the chicory can be roasted, ground, and used as a coffee substitute. 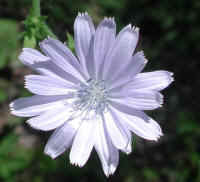 (Chicory (Cichorium intybus) - 02) The actual size of the chicory flower is about one inch across. Each petal has a distinctive five fingered or toothed outer edge. 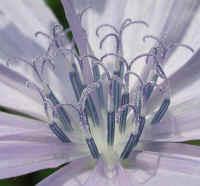 (Chicory (Cichorium intybus) - 03) This enlarged photo of the center of the chicory flower shows the spectacular beauty of God's creation. If we would only learn to look for this kind of beauty in the common things around us, perhaps we would appreciate what we have been given even more, and seek to protect our environment. 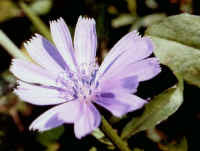 (Chicory (Cichorium intybus) - 04) This photo of chicory was taken by Dianne Stoess, who submitted it to us on 28 July 2003, with our thanks. (Chicory (Cichorium intybus) - 05) We took this photo and the following photos of chicory on 30 June 2010, along the side of the road while on one of our walks. 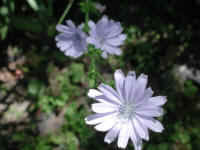 This is the earliest that we remember seeing chicory in bloom. 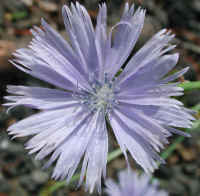 (Chicory (Cichorium intybus) - 05a) Unlike most members of the aster family, Asteraceae, which have both perimeter ray flowers (commonly thought of as petals) and central disk flowers, chicory only has ray flowers. (Chicory (Cichorium intybus) - 06) This is another look at the early blooming chicory flowers. (Chicory (Cichorium intybus) - 07) In this photo, we are looking down the hairy stem of the chicory to see the much larger basal and clasping lower leaves on the stalk. 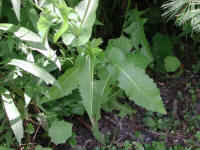 (Chicory (Cichorium intybus) - 08) The chicory basal leaves look something like dandelion leaves. 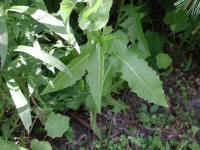 The stem leaves are lanceolate to linear and are fully clasping. 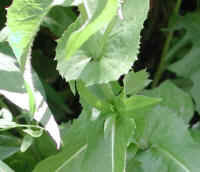 (Chicory (Cichorium intybus) - 08a) In this photo of the chicory leaves and stem, we can see the hairs on the stem and back of the leaves, and the fully clasping lower stem leaves with their toothed edges. 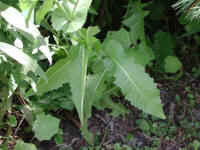 (Chicory (Cichorium intybus) - 09) This is another look at the lower leaves and stem of the chicory. (Chicory (Cichorium intybus) - 10) This is another look at the chicory flowers. 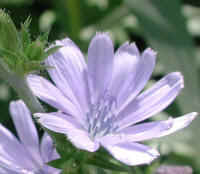 (Chicory (Cichorium intybus) - 11) This is another look at a chicory bloom with its 5-toothed ends on the ray flowers.